And they are looking outside the traditional "off-white ceramic tile" box. Our design consultants love watching trends like this pop up. 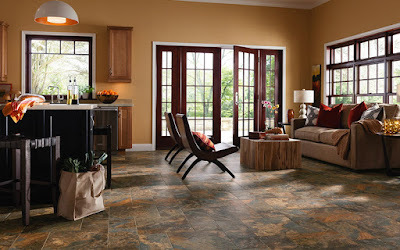 Let's see what they have to say about this Indianapolis tile flooring trend. 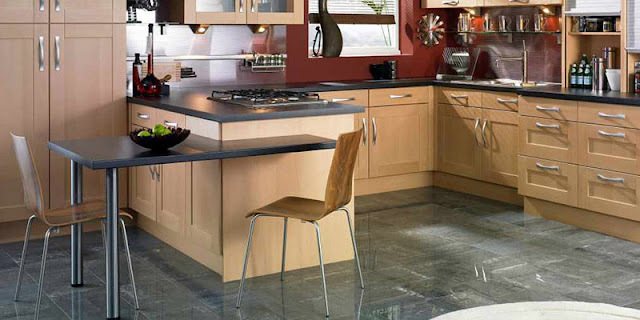 Grey remains one of the biggest trends in flooring this year. One modern way to get that grey look is with a concrete floor... or a concrete-style floor. The look of concrete on the floor has an industrialized, contemporary feel that can be very fun in a kitchen or rec room. Kermans carries porcelain tiles that look like concrete. These tiles bring in the textures, patterns and large format sizes that mimic a concrete floor. Texture is another current flooring trend in any style flooring - carpet, area rugs, hardwood or tile. Our designers recommend looking at versatile porcelain tile to add a surprising range of texture to your floor. Porcelain is such an excellent tile material because it can be made to look exactly like a completely different type of flooring. It brings all the benefits of tile, but with the look of something much higher maintenance. One of our favorite ways to bring texture into a room? Porcelain linen tiles. Barn wood. Distressed wood. Whitewashed wood. All popular wood flooring trends that tend to be on the higher end of the budget spectrum. Until you consider tile! Once again porcelain tile steps in with a wide range of options that look like wood but with far easier maintenance. What's the one thing these popular tile trends have in common? Porcelain tile. Today's manufacturing techniques have created a tile product that looks like nothing you've ever seen before. Actually, it looks just like things you've seen before... but not from tile! Stop by Kermans Indianapolis flooring store and ask to see our collection of porcelain tile. Even if you weren't considering tile before, we're willing to bet it's something you'll be considering after seeing some samples.